This page Alchemy is part of the mysticism series. 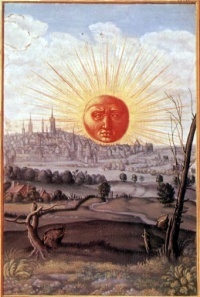 In the history of science, alchemy (Arabic: الخيمياء, al-khimia) refers to both an early form of the investigation of nature and an early philosophical and spiritual discipline, both combining elements of chemistry, metallurgy, physics, medicine, astrology, semiotics, mysticism, spiritualism, and art all as parts of one greater force. 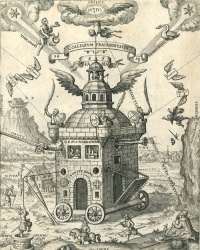 Alchemy has been practiced in Mesopotamia, Ancient Egypt, Persia, India, and China, in Classical Greece and Rome, in the Muslim civilization, and then in Europe up to the 19th century—in a complex network of schools and philosophical systems spanning at least 2500 years. Unless indicated otherwise, the text in this article is either based on Wikipedia article "Alchemy" or another language Wikipedia page thereof used under the terms of the GNU Free Documentation License; or on original research by Jahsonic and friends. See Art and Popular Culture's copyright notice. This page was last modified 08:49, 18 May 2013.